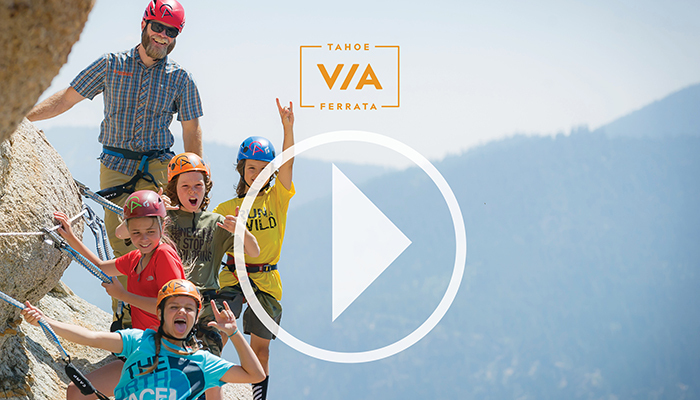 Watch the Tahoe Via Ferrata in action! After years of dreaming and planning, we are BEYOND thrilled to officially announce the Tahoe Via Ferrata at Squaw Valley! 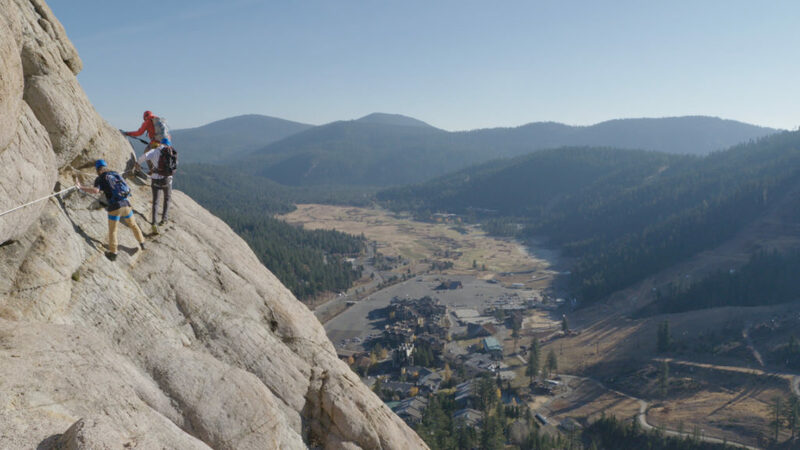 The Tahoe Via Ferrata will ascend the iconic 1000’ Tram Face in Squaw Valley, our home, and one of the coolest rock faces around. Construction of the first two routes begins within the next few weeks and we plan to be operational by late September. We’re excited to bring the first Via Ferrata to the Lake Tahoe region! If you’re unfamiliar with Via Ferrata, the experience allows non-climbers to experience the exposure, excitement, views and accomplishment of climbing a big face, with no requisite technical skills and an extremely high degree of safety. (That said, even for rad mountain athletes, they are so much fun.) The designated routes are retrofitted with permanent steel anchors and cables that allow participants to be safely connected to the rock 100% of the time via a Continuous Lifeline System. All climbs will be led by our experienced team of AMGA (American Mountain Guide Association) trained guides who will teach participants how to navigate the rock face while introducing basic climbing techniques. Gaining a new perspective of Olympic Valley. The Via Ferrata routes will allow even those with no climbing experience the opportunity to safely scale the iconic Tram Face, exploring high alpine terrain while taking in the beautiful vistas. Via Ferrata, Italian for “iron road,” originated during the first and second World Wars. In order to aid troops in crossing the high peaks and passes of the Alps, the rock was retrofitted with steel ladder rungs and cables. The system allowed higher numbers of troops to travel efficiently through technical terrain. The steel “aids” made the challenging terrain accessible to soldiers with no specialized climbing skills. After the wars, people started climbing these routes for fun and a new sport was born. Today, there are hundreds of “Vias” around the world, and adventurers from every walk of life are able to explore and enjoy the installations. How is Via Ferrata different than Rock Climbing? The first and most important difference is the safety line. Our Via Ferrata will have a half-inch stainless steel cable that runs the length of the route. We will be using a “continuous life line” system, where unlike traditional Via Ferrata lanyards, it is impossible to detach from the cable until the end of the route. The other main difference is the “aids” that are installed along the route. In sections where the rock is steep and too difficult for non-rock climbers, steel handholds, rungs and footholds are installed. Additionally, bridges and spans are installed to cross gaps and other impassable features. Follow @tahoevia on Instagram and Facebook to see our building progress and countdown to opening day with us.